I write this note to you on All Saints’ Sunday. We celebrate and remember all the faithful saints who have come before us. We rejoice in the legacy that they left us. And it is our prayer that we would follow their example to pass the faith on to the generations that follow. Good Shepherd was launched in 1960. It experienced growth and expansion through the first 40 years of its existence to the end of the millennium. We are grateful for all who have poured their hearts and souls into building this ministry. But, there is a life cycle with every church. Just as there are seasons of growth, there are seasons of decline. During the last 18 years, we have experienced some years of moderate growth, but most have been marked with decline. Many of us look forward, and long to return to that time of life and vitality that was experienced in the first 40 years of Good Shepherd’s existence. But for all the effort that has been made, it has not happened. Earlier this day, I shared a message about the life cycle of the church. I also spoke about how the greater the decline, the greater the intervention must be to stem the decline. I want to encourage you to check this message out. It can be found on our website at gs4nj.org/allsaintssunday. There is RENEWAL which involves tweaking and refocusing the ministry on keeping the main thing the main thing. 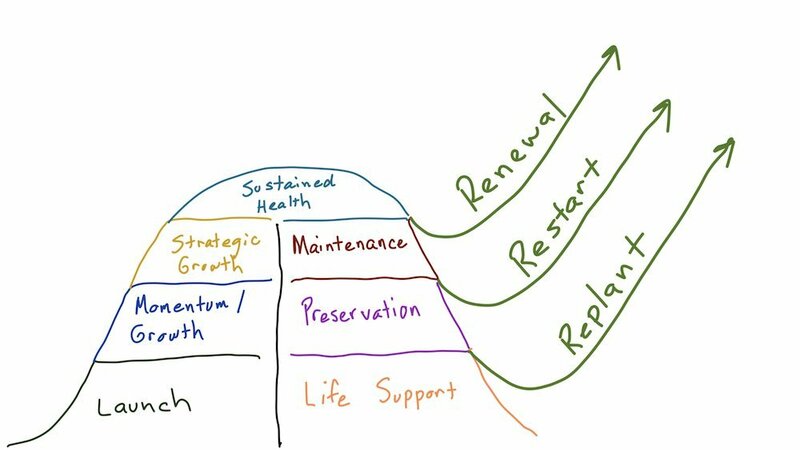 But if renewal is not enough, then there is a RESTART, which involves reimagining and re-engineering the ministry. This is tearing down to build up. And if there is not the ability to restart, then the only option left is to REPLANT. A replant is when a ministry dies and a whole new ministry with new people come in to write a whole new story. Why do I write this today? Good Shepherd is at a crucial time in its history. I believe we have come to a point to RESTART our ministry. We have worked at RENEWAL for the last five years with moderate success. But we have not experienced any real growth. The other choice we have is to continue to fade as many churches in the United States are doing, leading to the inevitable death. Today, I want to invite you to reimagine the future of Good Shepherd together with me. Joining Jesus on his mission, with the help of the Holy Spirit, I want you to join me in seeing new life and vitality put into God’s work in Old Bridge, NJ. There is an opportunity before us to consider a RESTART. Good Shepherd has been presented with a substantial offer to SELL OUR CHURCH PROPERTY. This may be shocking and even upsetting. At the same time, it may be exciting and uplifting. However you may feel, we are left with a substantial choice that will greatly affect the future of our beloved congregation. What does this mean? There is no doubt that you have a lot of questions. This is why we have scheduled two Town Hall Meetings for Thursday, November 8 and Tuesday, November 13. Both of these meetings will start at 7:30pm at Good Shepherd. These meetings will be an opportunity to listen, to ask questions, to share your input, and to pray. I want to assure you that this is not the end of Good Shepherd, but a way to rethink and reimagine this ministry much like the founding members did in 1960. The church is more than a building, but a people. We have a Voters’ Meeting scheduled for Sunday, November 18 following our 10:30am worship service. It is during this meeting that we will decide whether to accept or decline the offer that has been presented to us. We encourage your participation (if you are a voting member) at that meeting. In ending this letter, I want to remind you that this is not my church nor is it your church. This is God’s church. In all things, we seek his will be done. We don’t need to fear making the right or wrong decision – all things do work for the good of those who love him and have been called according to HIS PURPOSE. We can live in confidence that his purpose will be fulfilled whatever happens.